We are a company that focuses on only kitchen refurbishments and resprays. We are not a spray shop who occasionally does kitchens, a car sprayer giving it a go or someone who has just discovered chalk paint. We have seen (and rectified) failed kitchen painting attempts. It is one of the most expensive rooms in a property so it needs a professional approach. We are experienced in spray painting kitchen doors along with full kitchen resprays. 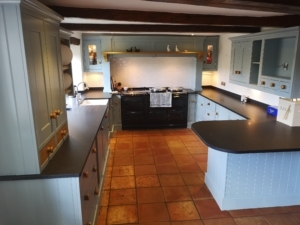 We can also offer a hand painted finish too, which can suit more traditional kitchens or bespoke kitchens. We are members of Checkatrade with an feedback rating of 9.8/10 from over 70 feedbacks. We follow the ethos that we are only as good as our last job. 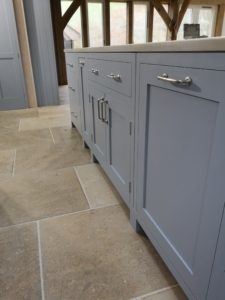 As you navigate the site you can see projects from start to finish, feedback from genuine customers and if you want to see the finished article we most likely have a customer in your area who can show you the results. We are also part of a the original national network for kitchen painters, Traditional Painter. We follow traditional values with a very modern approach. We aim to be as competitive as possible in our pricing however we believe our experience and service is unrivalled in the South-West. We are confident that you will be pleased with our service from start to finish. If you have another quote, we are happy to take a look and see if we can match it. From our research we have discovered that the services out there vary considerably and are not always as thorough as ours. We take pride in the techniques we adopt and the quality of our kitchen cabinet painting work. 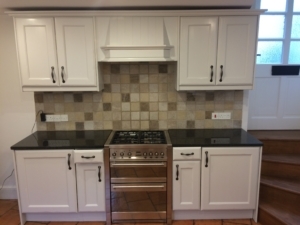 We make sure we use the best products available for kitchen refurbishments and always offer a guarantee on workmanship. We use a variety of techniques, products and spray equipment to deliver the highest possible finish. 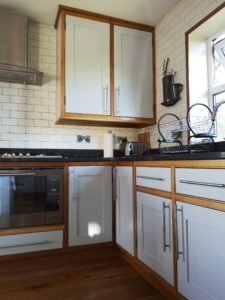 We have extensive experience working with all types of kitchens. Large or small, solid wood or foil wrapped kitchens, old or new we have encountered every type of kitchen. This means your kitchen cabinets are in good hands. 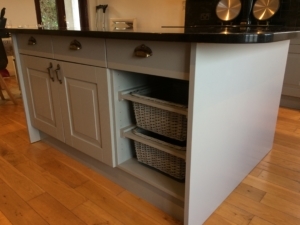 As we have seen a lot of different kitchens over the years when spraying or hand painting cabinets we are able to give advice on colours, styles and cabinet furniture when quoting for work. All of this advice is free and under no obligation. We find clients can vary from having the exact concept in their heads to not having a clue how they want their updated kitchen to look. 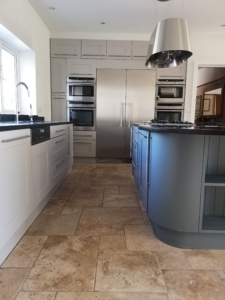 To help with the process we can give you examples of the kitchens we have sprayed, many of which you will find on this site. We will also be honest if we think something won’t work. All the images on this site are genuine kitchen projects we have either sprayed or hand painted, we never use stock images from the internet.